I LOVE this skirt! Not only is it pretty snazzy, if I do say so myself, it's also super practical, multifunctional even. It has pockets, yes. Pockets are good. It's also super spread-out-able, you can lay your sandwiches on it and look glamorous at the same time. 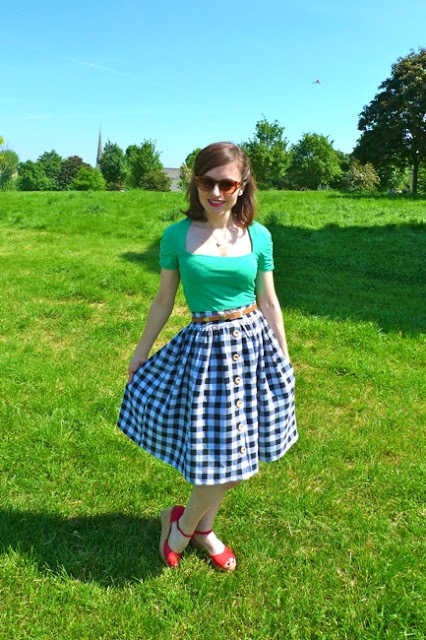 Moreover, while enjoying the sunshine in the park today I realised that, if I team the skirt with my red Esther Williams swimsuit, I can look glam, carry sandwiches in the pockets, then whip the skirt off to lay out on and use as a full picnic blanket. Good, eh? Okay, so I think I've made my point about how practical it is. It's also incredibly easy to make. I didn't use a pattern, just worked out the measurements and sewed it up. The fabric is a fairly heavy but super drapey and nicely textured cotton-linen blend that I scored from Brixton market for £2/m. Plus it's really easy to wear - casual yet chic at the same time.